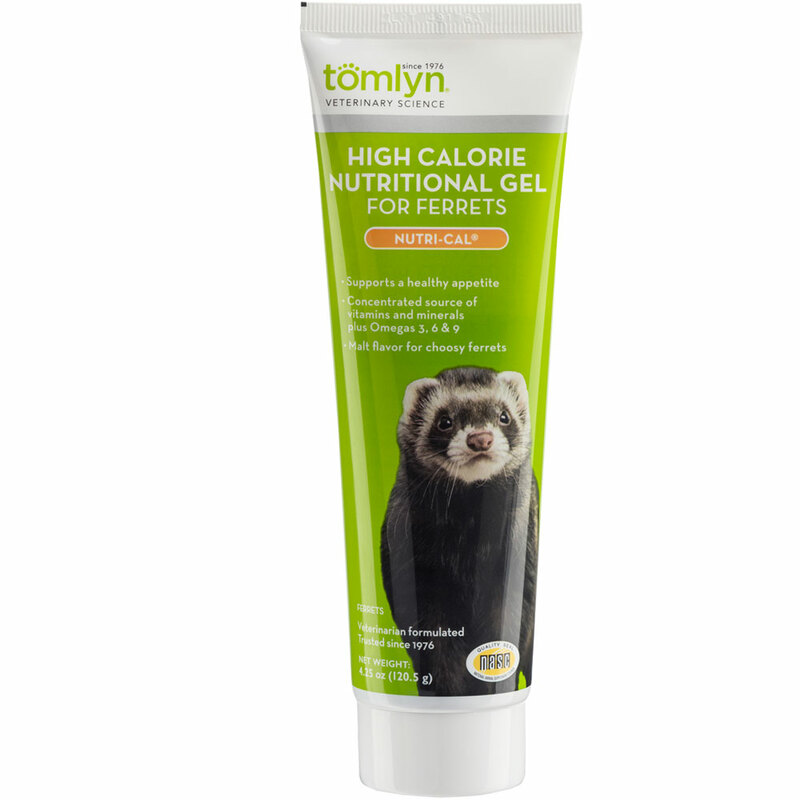 Tomlyn Ferret Nutri-Cal specially designed for your furry firend, this supplement provides vitamins and minerals that are essential for your pet. Additionally, this product stimulates appetite and provides a boost of energy. When it comes to the health of your ferret, you should never settle for anything less than the best. If you want to ensure your ferret regularly receives the nutrition that is required for optimal health, this product is definitely for you. Corn syrup, Soybean Oil, Malt Syrup, Water Fish Oil, Cane Molasses, Sodium Propionate (a preservative) Gelatin By-Products, Silicon dioxide, Potassium Sorbate (a preservative), dl-Alpha Tocopheryl Acetate (Vitamin E Supplement), Xanrhan Gum, Magnesium Sulfate, Manganese Sulfate, Ferrous Sulfate Heptahydrate, Vitamin B12 Supplement, Thiamine Hydrochloride, Niacin Supplement, d-Panthenol (source of Pantothenic Acid), Pyridoxine Hydrochloride, Potassium Iodide (source of Iodine and Potassium), Vitamin A Palmitate, Folic Acid, Riboflavin 5"-Phosphate Sodium (source of Vitamin B2 and Phosphorus) and Vitamin D Supplement. To acquaint yor pet with the flavor, place s small amount of gel on its nose or in the mouth. To supplement your pet's caloric or nutritional intake: 1 ½ tsp per 10 pounds of body weight daily. When your pet is not eating its full ration: 3 tsp (1 tbsp) per 10 pounds of body weight daily.